Are you looking for ways to check Google keyword rankings Accurately? One of the most important factors in choosing the right keyword in order to make them rank & track the keyword position in search engine. It is absolutely necessary for a blogger or SEO professional to check their Google keyword ranking for target keywords. One of the most common mistakes bloggers and website administrators make is that they write and publish articles without targeting any keywords at all. The keyword Ranking/Tracking shows your sites position in context to a given keyword in a particular search engine (google search). Well, Defining the right keywords in content makes easy for search engines to display your article on the top results when people search for it. As we all know keywords are used by people on search engines (Google) to find information online. Why Keyword Tracking Is Important???? SEMrush SEO tool lets you do keyword research, track keyword ranking, check backlinks, check competitor ranks, and most importantly, do a complete SEO audit of your blog/website. This is a powerful and versatile competitive intelligence suite for online marketing. It is very simple to use, just enter your website URL or the individual URL of a blog post, and it will show you which keywords you are currently ranking for. You only need to enter the URL you are checking Further, this tool display list of keywords that your web page is ranking for. After providing the above information, This tool helps you to find the following points. Note: This tool does not check Bing – just Google. SERP’s is also the best tool for keyword rank check that easily checks all your Google keyword rankings. And this one is also free like Google Rank Checker (it’s completely free). If you are blogging for a while, you might have heard already about Moz. It is one of the highly authoritative blogs on SEO. They also have incredible SEO tools and products that help you boost your search rankings. They have a tool called Moz Rank Tracker which helps you track all the keywords on Google. Their tools get the latest information from search engines for all the keywords you are targeting. You don’t even have to check your keyword rankings manually every single day. You can get all the information directly to your email whenever your keyword rankings increase or decrease on Google. 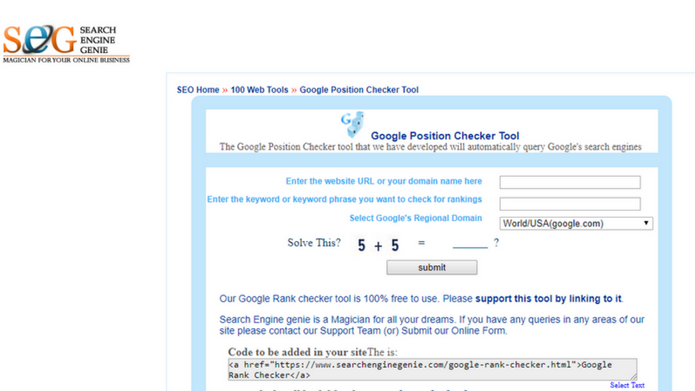 To check your Google keyword rankings, visit the website and you will see the following image. Here’s a free keyword rank checker tool called Rank Tank. Not only that, but you will also get a full understanding of what keywords you do rank for on Google for FREE. Simply visit their site, enter your details to create a free account with them and enter your keywords including the domain to easily find your keyword positions on Google. Go to their website and enter the keyword you are targeting for. Also, include your own domain name. You can include your competitor’s domain as well if you want to compare your keyword performance along with your competitors. You can use this tool not only to track keyword ranking performance in a graph but also allows you to view a detailed history of your keyword performance on different search engines. You can also export all your keyword ranking results in PDF, HTML formats for future use. Of all the keyword rank checker tools on this list, SemRush is my personal favorite for checking keyword positions in Google and Bing searches. I’m sure you’ll like it as well, as it also offers other features such as a backlink checker, a full site audit, and other cool things.